Few people ever experience the never ending beauty of an Okefenokee Swamp sunrise. Do you want to know just how much beauty you are missing? The beauty of a cool mist-filled sunrise in the Okefenokee can take your breath away. After a night spent camping along one of its trails, few things can rival sitting quietly on the edge of a watery grass-filled prairie in the swamp with a good cup of coffee, watching the dawn break. A chorus sung by an uncountable number of birds welcoming the new day, accented by the closing refrains of the night's symphony of frogs, toads, insects, and night birds is a concert to behold. True outdoor adventurers will be lulled into a sense of timeless peace as they enjoy this experience. What is on this page? Glad you asked! IV. A You Tube video of Okefenokee Joe singing "Swamp Wise"
VI. Finally, a few resource links if you want to know more. 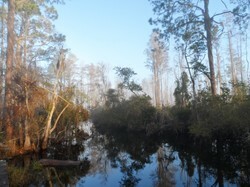 A beauty greater than any created by man, the Okefenokee at sunrise is a wonderful gift to mankind. The cries and squawks of various water birds and the singing of the multitude of song birds fill the early dawn. With over 300 species of birds within its regions the swamp has a lot to offer birders and photographers. The echoing sounds of a Pileated woodpecker’s hard knocks seem, to a dreamer’s imagination, to be a drummer’s call from the past of ancient Native American mound builders who once passed this way. Here a fish slaps the surface of the tea colored water hoping to make a breakfast of a passing water spider. 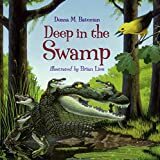 There a small splash signals a furious leap off a lily pad’s watery surface into a clump of nearby grass to save a small yellowish leopard frog from being a determined bass’ next meal. The deep throated notes of an occasional bullfrog put a sporadic finish to the passing night’s symphony. The rising sun brings to life the color of the swamp, the largest freshwater swamp in the US. The tea colored waters are the beginnings of two regionally famous and important rivers. The first is the St. Mary’s which formerly served as the dividing line between Spanish Florida and the young United States at the end of the 1700’s. It is today a part of the Florida and Georgia boundary. The second is the Suwannee River which was made famous by songwriter Stephen Foster in 1851. This means that the waters of the swamp are not still and stagnant as some might think. They actually flow slowly southwards giving birth to these two famous rivers, the St. Mary’s on the southeast corner and the Suwannee on the swamp’s southwest corner. The colors of the many grasses and plants of the swamp prairies, highlighted by the rising sun, shine with golden shades, yellows, reds, and browns. Speckled throughout are streaks of light green and bits of darker green of the newer growth fighting to gain a path to the sun’s rays. Here and there the sudden sharp white of an egret can be spotted and the darker grayish and pale blue of herons and sand hill cranes may be seen. The sun’s rising rays will suddenly glint off the wet blackish shell of turtles which now rise up and crawl out on logs to warm up in the sunshine. As they dry in the sun many of these turtles take on a grayer look with slashes of yellow and tan and specks of orange here and there. Now in the full light of a morning’s sun come the dragon flies. Some of them with tails of varied shades of blue, others with green adorned with black circles. These patrol the tops of the grasses and often hitch rides on passing canoes and kayaks of travelers enjoying the vistas and sounds. The knowledgeable among them will be grateful for the dragon flies, as they are the “protectors” of we who pass through. We, who often are the favorite target of numbers of the yellow biting flies. Dragon flies seem to live for the moment when they can swoop down and capture unsuspecting yellow flies and devour them head first. As savage as this may seem, it is the way of the swamp. Some things must die so that others may live. The rising sun continues its journey, the winds blow a little, the grasses and hanging Spanish moss of the trees wave as if to tell the leaving camper, “Goodbye! Ya’ll come back soon now!” And most of us do come back. Okefenokee Joe sings "Swamp Wise"
What is your favorite time of year to go camping? Time-Life Books wonderful photographic account of the Bayous with informative, absorbing text. The Okefenokee Swamp is home to hundreds of bird and plant species and wild animals. It is a great get-a-way location for camping, birding, wildlife photography, and relaxing. This is a very relaxing and interesting little walk through a wooded area. It ends in a prayer garden dominated by a 15 ton cross which stands in the center of the garden.